Is there any danger to the use of the Ouija board? The Ouija board, or as it is also known as the talking board, spirit board or even witch board. Is it simply a toy, or is there is some sort of danger attached to it's use, danger from evil spirits, ghosts or demonic forces? Danger that these entities could possibly attack the user or users on a spiritual level. The history of automatic writing using an oracle or planchette goes all the way back to approximately 1000 years BC in China. 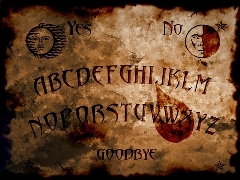 The modern version of the Ouija board, was introduced in the latter part of the nineteenth century by the toy maker Parker Brothers, and was distributed and sold primarily as a toy. Some religious denominations, especially mainstream Christians, believe that using the Ouija board can lead to demonic possessions and other paranormal problems. And these Christian groups also believe that when you do use the Ouija board you're actually communicating with demons or devils, not with the souls or spirits of people who may have passed on. And even some occultists believe that it's use can open portals or doors to the spiritual realm and allow ghosts, demons and evil spirits to enter our realm of existence and haunt, possess or in some other manner harm or annoy anyone who may have used the Ouija board. In my personal opinion this is all bunk! The Ouija board is nothing more than a toy. If the oracle moved on its own, without being touched, then and only then would I believe it has any mystical powers. But because it has to be touched with the fingertips of the people involved in the seance, I think it is nothing but someone, either intentionally or subconsciously moving it. And I believe that if there is any danger attached to its use, then I believe it comes from the subconscious psychology and fears of the person or people using it. If the individual or individuals, who are using it, sincerely believes they are communicating with ghosts or spirits, than I suppose it would't take too much more to make them also believe that they may become possessed by these ghosts or spirits. Especially if they believe it is sinful or evil to be even using the device in the first place.